Beautiful, isn't it? It's an electric pressure cooker. Actually, it's a 3 in 1 multifunction electric pressure cooker, meaning it's also a slow cooker and a rice cooker. Calling it a rice cooker is a little bit misleading because it cooks rice under pressure, so really the only thing that makes it them call it a rice cooker is a pre-programmed button for rice. That's a little like calling a microwave a 2 in 1 microwave and popcorn cooker because it has a popcorn button. That minor point aside, it's still awesome. 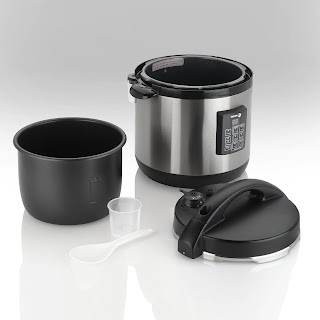 For those of you who have never used a pressure cooker (which was me until this past Christmas) let me tell you why people who own pressure cookers rave about cooking with them. It's because they are magical. It's true.You put your food in there, turn it on (or put it on a burner and bring to high pressure) and in minutes you have a cooked meal. Most food cook in about 1/2 to 1/3 or the time it would take in a pan on the stovetop. So why doesn't everyone have one? Part of the reason is that the food cooks under high pressure, so there is a greater chance that an accident with a pressure cooker would be bigger than with regular cooking. Pressure cookers decades ago didn't have as many safety features as they do now, so most stories that have been passed around about pressure cookers exploding have to do with older pressure cookers. Today they have many more safety features so it's impossible to steam your face off by opening it to early. Which is good because steaming your face off just doesn't sound fun. There's a great page here if you want to learn more than you ever wanted to know about pressure cooker safety. Electric pressure cookers like I have are a great way to get into pressure cooker because they are idiot proof. You don't have to watch your pot to see when it gets to high pressure and then turn the heat down and start timing. The electric ones do that all for you. That said, having an electric pressure cooker makes some people with traditional pressure cookers think you are a sissy pants. The stovetop pressure cookers get to a higher pressure and can cook about 10 percent faster than electric ones. Plus, you have a little more flexibility with cooking because you can release the pressure very quickly under cold water from a tap. You can adjust for this with your electric pressure cooker, and it seems like with most pressure cooking recipes there's a little bit of variance on how long it takes to cook things. You just have to try it out in your own pressure cooker and see how things work for you to find the perfect amount of time to use. I know that not everyone who reads this blog owns a pressure cooker, and I don't think you're going to run out and buy one just because I say its awesome. I do know that at least two people who read this blog own a pressure cooker (one of those people is my mom), so in the future I'm going to post some recipes that I've been using for my pressure cooker, but with modifications, if it can be modified, for cooking on a stovetop. I'll aso try to include modifications of some regular recipes that I use that can be made faster with a pressure cooker. You know, to convince you that need to run out and buy one. I'm evil like that. 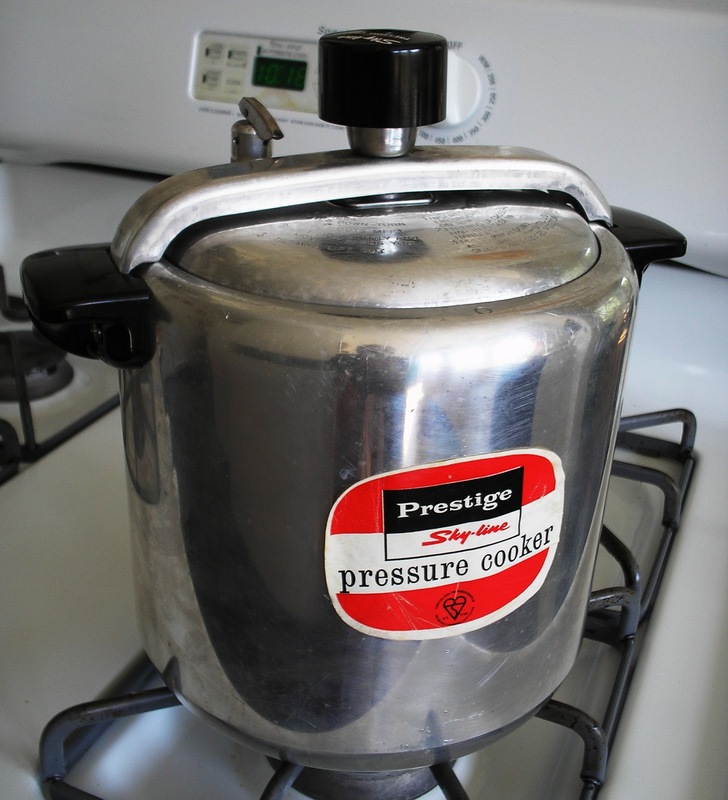 I love that you did a blog on pressure cooking!! I think we should do more blogs on cool "kitchen gadgets" that we find!! And now I REALLY want a pressure cooker/rice cooker/facial steamer/miracle kitchen electronic!